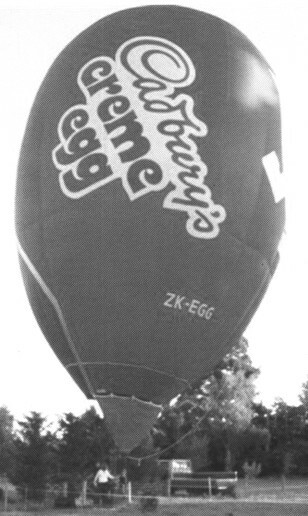 First registered to Cameron Balloons of Bristol, UK, on 11-02-2000 was the 65,000 cu.ft “EGG-65” G-OZEG. This is a two-person balloon built to order for Cadbury’s in the UK to advertise one of their products. The balloon has only three hours on it, all done in NZ before 2003. Cadbury now has no finan-cial interest in the balloon, which was cancelled from the UK register on 17-04-02. Cameron Balloons offered the unit to Andy Nicholson, the NZ dealer, and it became ZK-EGG, with Balloon Affair out of Christchurch.